The past summer has seen something that many Egyptians had long forgotten: rolling power blackouts. Reports have cited that these month-long power cuts have affected everyday life for Egyptians in many ways. The outages stranded passengers on the Cairo Metro, raised concerns about night time safety and contributed to water supply interruption. Over a period of over a month the frequency of power cuts increased dramatically and were mapped by the crowd-mapping website, Kahrabtak. Power outages in some areas lasted 18 hours a day, hitting poorer residential districts especially hard and prompting protests in Fayoum, Gharbiya and Giza among others. The overall economic costs of the power outages have also been substantial. Frequent power outages resulted in significant losses for enterprises and manufacturing in forgone sales and damaged equipment ( Eberhard et al. 2008). A recent World Bank Study found that in Egypt the value lost (percentage of sales) in 2008 due to electrical outages was approximately 3.18% , Yet with estimated daily production losses of around 25%, it can only be assumed that we will see a much higher figure for value lost. The outages, as well as the failure of back-up generators, also halted trading on Cairo’s stock exchange, leading to value losses of about US$164 million and prompting a temporary move to the Smart Village, west of Cairo, to avoid further disruptions. Over the past decades, both the total generation and peak generating capacity have grown steadily in an attempt to keep up with total consumption and peak demand. And while Egypt has one of the lowest installed electricity generation capacity levels per capita in the Middle East (under 500 watts per person), statistics issued by the Egyptian Information and Decision Support Centre (IDSC) show an overall growth in both generation capacity and in consumption. In this dynamic of growth in capacity and consumption it was thought that an 8% margin was maintained between the installed electricity capacity (maximum electricity that can be generated at one time) and peak load (maximum electricity demand level). However, recent Ministry of Electricity and Energy statements have indicated that while Egypt can produce 30GW nominally, in fact only 24 GW is generated due to plant maintenance works. While the impact of maintenance works during the winter (where peak demand is estimated to be 21 GW) is not substantial, it is during the summer months (where the peak load is 27 GW) where issues arise. One of the direct results of this are the 2012 summer power cuts, which have raised concerns of a systemic electricity capacity shortage (Shafey, 2012). Examining electricity production and use statistics in Egypt highlights three key issues; firstly, nominal generation capacity is less than summer peak demand and, secondly, peak electricity demand has increased by more than 300% between 1992 and 2011 and finally the customer base using what electricity is generated has increased five-fold in the past two decades. The underlying causes of the 2012 blackouts can be attributed to a complex combination of political and organisational factors, climate change and the resultant urban heat island effect, developmental and socio-economic factors, cultural factors as well as infrastructure and supply issues. It is only by looking at each of these inter-related factors and analysing their contribution can the critical pathway to addressing this issue be determined. The first Egyptian electricity generation and distribution organisation was first set up in 1893 and was, at the time, owned and controlled by private companies. In 1962, under the nationalization plan set up by Nasser, they were transferred to state ownership (under the guise of the Ministry of Electricity and Energy) making electric power a Government-owned monopoly (Yousri, 2011). As of mid 2007 all six generation utilities; nine distribution utilities; and one transmission company were state-owned and fell under the direct management of the Egyptian Electricity Holding Company (EEHC) (Eberhard & Gratwick 2007). Under this state-owned monopoly system, the highly bureaucratic and centralised legal and political systems emerged as major challenges to attracting foreign investment in many areas including that of infrastructure development. The post-revolutionary political climate that has centred around political manoeuvrings and amassing power has left little time and will for addressing these concerns. The lack of stability that resulted from the repeated governmental changes and cabinet re-shuffles has also left little room for long-term policy reforms to be initiated. Another socio-political issue is that of energy subsidies. The Egyptian subsidy system is considered to be one of the most inefficient in the world and supports a socially motivated pricing system that imposes tariffs that are significantly lower than the real economic cost of electricity production and supply. Over 70% of the total subsidy bill of 150 billion EGP is directed towards fuel, much of which is used to keep natural gas below market prices. Since 90% of the electricity generating capacity (as will be discussed) comes from natural gas this leads to shortages that affect the electricity supply in the hottest months of the year during the peak demand period (Halime, 2012). In addition to encouraging wasteful practices this system increases the fluctuation in demand, thus triggering a huge need of additional power generation capacity (Yousri, 2011). In terms of longer term prospects, this system does not offer a sustainable financial basis for correct maintenance and precludes new investment. The extent of the impact of climate change globally is the subject of many studies and future scenarios. In Egypt temperature modelling scenarios are predicting an overall temperature rise of 1.2oC by 2020s and of 3oC by the 2070s. According the 2006 Census, the total population of urban areas in Egypt was over 31 million (43% of the total population) (CAPMAS, 2013). This rapid urbanization, industrialization, and reduction in vegetation cover that have occurred have afflicted most of its major urban hubs with the “urban heat island” effect (UHI). The UHI effect is the modification of local city climate compared to its surroundings. It can lead to a temperature difference of around up to 3oC for city with a population of about 1 million. For a city the size of Cairo with a population of well over 15 million, the effect of the UHI is extremely significant. An important unintended consequence of both these global and local climate changes in hot-arid countries is the increased usage of electricity-consuming cooling and refrigeration devices such as air conditioning units, fans and refrigerators. The use of air conditioning units in Egypt has increased dramatically over the 13-year period from 1999-2012. Official figures indicate that the number of AC units rose from 196,000 in 1999 to three million in 2009. Due to the introduction of cheaper units to the market, this then doubled to six million units by 2012. In addition to accounting alone for 20% of energy consumption the use of these devices, in turn, worsens the UHI effect through the release of waste heat into the atmosphere. Egypt has one of the highest electrification ratios in the region with around 99% of the population having access to electricity (MENA-OECD, 2012). The percentage of the population without access to electricity has dropped by over 30% since 1975. To achieve this, the grid has had to cater for not only a growing percentage of the population with access to electricity, but also a population that has doubled. To put this in perspective, the customer base for the electricity grid in Egypt has increased from 4.5 million households in the early eighties to 23.8 million in 2007/2008. The sustained economic growth in the period leading up to the 2011 revolution triggered a rapid increase in per capita energy consumption. In line with most countries in the Arab world, energy usage norms and habits have changed dramatically over the past few years, with the increased expectation of achieving and maintaining thermal comfort levels throughout the year for a large segment of the society. Unsurprisingly the growth in peak demand seemed to track changes in GDP. Similarly, the average annual growth rate of energy consumption per capita between 1990–2006, was estimated at 2.34% closely tracking the average annual growth rate of real GDP per capita at 2.27% (Sadorsky, 2010). Like many cities in the Middle East, Cairo is a 24-hour city where the climate (especially during the summer months) has encouraged social activities to extend well into the night. The average daily peak demand time in Egypt generally occurs between 19:00 to 22:00. However, during the month of Ramadan, dramatic changes in lifestyle patterns leads to consequent changes in consumption patterns and peak demand. The uniformity of activities during this month for the majority of the population leads to an increase in the peak demand (as opposed to staggering activities throughout the day). When this is coupled with a spike in temperature, this also causes a longer peak demand period. In the case of last year’s Ramadan, the peak demand period went up to 19 hours a day, beginning from 08:00 in the morning and continuing until after 03:00. at the time of the suhoor meal. This overload to the system caused some power stations to go out of service (Abu Al-Khair, 2012). Although Egypt provides more basic infrastructure than many comparable countries, much of it suffers from the chronic underinvestment and subsequent decline from years of neglect. The consequences of this can be dramatic and include the failure of power stations (such as Koraymat), which was highlighted as a main contributor to the outages. Grid infrastructure problems also account for the significant transmission losses in the system which in 2010 reached over 10% of all electricity output. In terms of the energy mix, more than 90% of energy consumption is met through generation using oil and natural gas(AfDB, 2010). Over that past few years, energy supply has been in constant decline due to the drop in oil reserves (Egypt’s oil production peaked in 1997 and became a net oil importer in 2008) and exports of natural gas. Despite Governmental assurances that the power failures of the summer would not occur in the winter because of less electricity consumption, more than 15 nationwide power stations halted electricity generation in December due to shortages of fuel such as diesel, natural gas and Mazut. 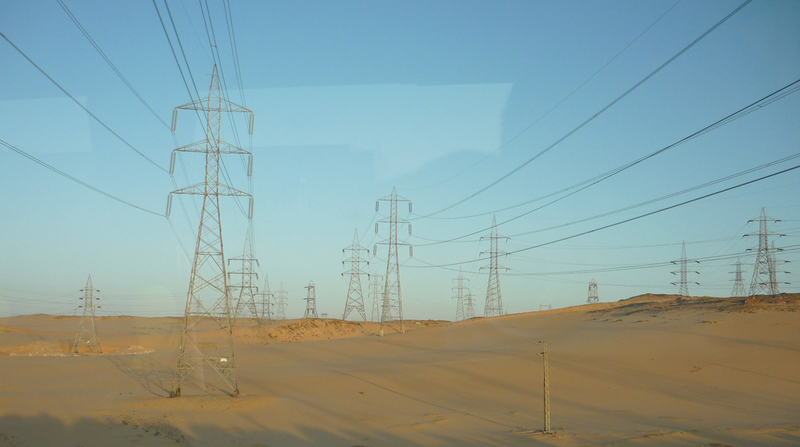 The Egyptian Electricity Transmission Company (EETC) confirmed that this lead, to the reduction of around 3000 MW of the daily electricity capacity. This discussion has focussed on attempting to offer an answer to the questions why did the 2012 blackouts occur and what are the underlying issues that have in some way on another contributed to it happening? Moving forward from this, the next crucial question to answer is how do we solve this problem? A number of these possible solution pathways will be highlighted and discussed in a subsequent article. Rokia Raslan is a Lecturer in Environmental Design and Engineering at the Bartlett School of Graduate Studies, University College London focusing on building energy performance and demand-side reduction strategies. As a trained architect, she has consulted on projects and masterplans in Europe, North America and the Middle East.